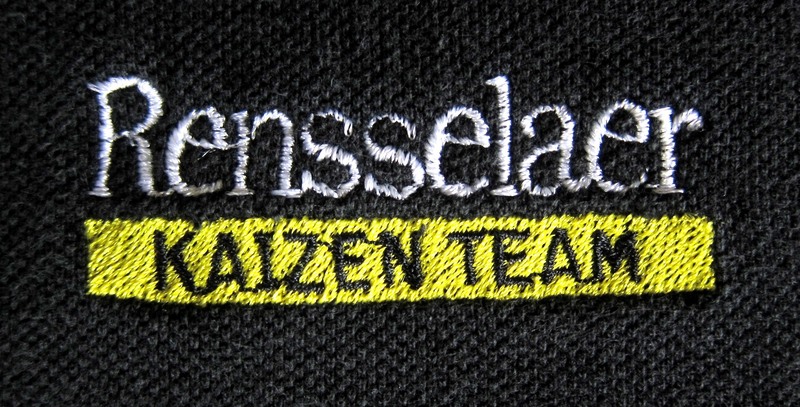 It has been nearly 11 years since the start of the academic kaizens that I organized and led at Rensselaer Polytechnic Institute (Hartford, Conn., campus). This was the first time ever that kaizen was used to improve an accredited academic degree program. Since then, there has been a lot of kaizen in higher ed for administrative processes, but nothing in academics (as far as I can tell). That’s unfortunate, because kaizen is a fun and effective process for improve individual courses and degree programs for the benefit of students and payers. The logo on the left was created for the kaizens that took place between October 2002 to March 2003 for our 10-course Executive Master’s degree program in management. The logo on the right was embroidered on polo shirts and given to kaizen team members to promote team-building. Team members (faculty, staff, alumni, administration, etc.) were proud to wear the shirt during our kaizens (and afterwards). 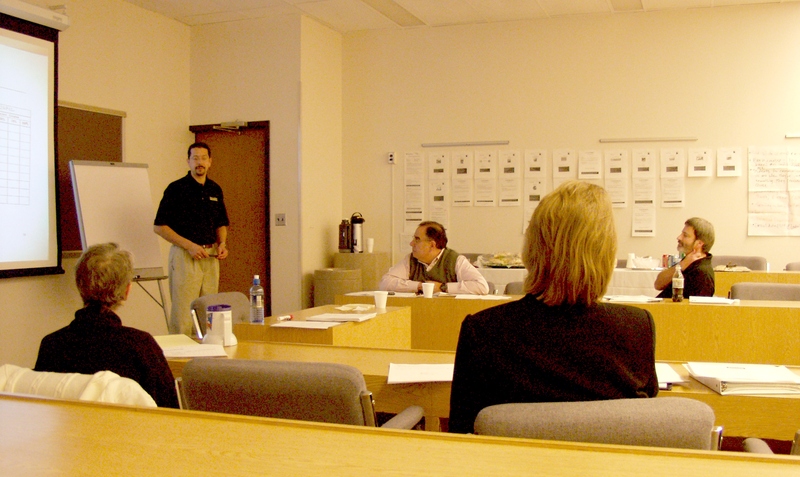 Below is a photo taken at the start of first kaizen in October 2002, which I facilitated. This was the first of 10 kaizens; one per course. It also served as a train-the-trainer session for faculty who wanted to facilitate subsequent kaizens. Kaizen participants included: (L to R), Lynne DeNoia, Bob Emiliani, Peter LaPlaca, Kathy Foley, Larry Grasso, and Kristin Larity (not pictured). The course syllabus, course learning objectives, etc,. posted on the far wall. These and other course materials were examined in detail and improvements to them were made in real time. I wrote a paper about our innovative work, “Using Kaizen to Improve Graduate Business School Degree Programs.” Don’t let the title of the paper fool you. What we did can be applied to any academic program, undergraduate or graduate, in any school (arts & sciences, engineering, law, medicine, etc). Kaizen can be used to improve any academic process. In preparation for the 10 kaizens, I created a team leader’s manual. It contained many of the same kaizen forms that I used in industry, but some were modified for higher education. I have updated the manual over the years, and you can download a copy here. With the published paper and kaizen manual in hand, and with some good thinking and a good plan, you should be able to do the same. Reflecting back on that experience, I am fortunate to have learned the kaizen process when I worked in industry. I thank my then-colleagues at Rensselaer for their interest in improvement and willingness to participate in a new experience. We did something special that informed a community of stakeholders that we were serious about improvement. My main regret was that this was a bottoms-up activity. I had to sell kaizen to RPIs president (SAJ) and provost (GPP), whose initial interest rapidly faded. I’m not sure why, but it seems the president preferred a different path, one that focused on spending a lot of money. This is a critical point of contrast between conventional leadership and Lean leadership. Conventionally-minded leaders spend money to improve. Lean leaders spend ideas. The former creates cost problems (and higher tuition prices), while the latter eliminates cost (and other) problems. The former gets you in the news, while the latter does not. The former maintains a focus on people (and people as the source of problems), the latter shifts the focus to process (and process as the source of problems). This is one of the challenges faculty will face if they want to kaizen courses in academic programs, from the bottom up, as well as other academic processes. They will run into conventionally-minded leaders whose long held concepts of improvement will be vastly different, and surely more expensive, than fundamental process and product improvement.